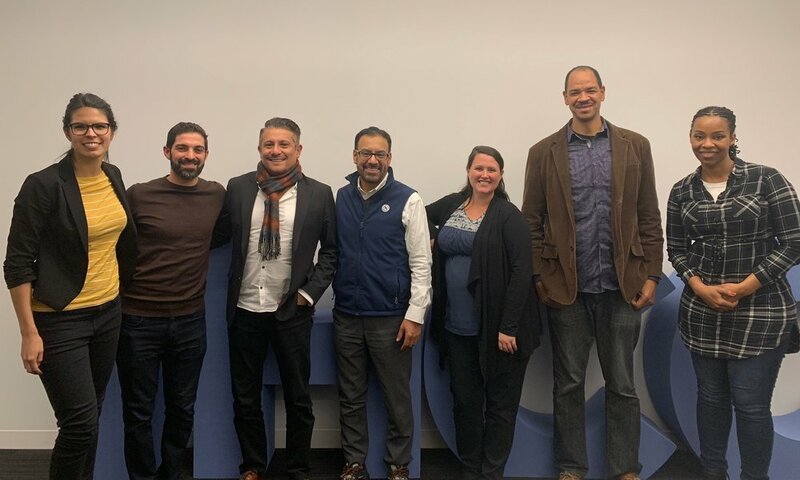 On March 27th, the Illinois Hispanic Chamber of Commerce (IHCC) and 1871 welcomed the twelve startups that make up Cohort 5 of the LatinX Incubator. For the next twelve weeks, the founders will become fully immersed in Chicago’s tech ecosystem as they focus on propelling their companies to the next level. The twelve startups range in industry from biotech to food tech. The program will culminate with the founders taking the stage for a capstone pitch demo day in June. The showcase is open to the public and draws a large crowd of hundreds to 1871 for networking and an opportunity to connect with the cohort. The LatinX Incubator, operated in partnership with 1871, will provide the startups with tailored educational programming, strategic connections, and technical support to help them succeed. Currently, less than 1% of LatinX entrepreneurs receive venture funding or angel investment. The LatinX Incubator is leveling the playing field by building an inclusive entrepreneurial tech ecosystem that actively supports diverse founders and sets them up for growth in the startup ecosystem. 3/AXIS - CEO & Founder Patrick Martinez|The 3/AXIS platform combines innovative personal finance tools with a dynamic learning environment that helps students build positive financial habits, reduce their student loans, increase their savings, and improve their financial IQ. Acosta - Co-Founder Antonio Garcia| Acosta is a mother-son duo selling handmade business casual clothing with a Latinx flair online. Their goal is to help early-mid-career professional women with diverse body shapes feel and look confident as they take on the world. CIND - CEO John Stringfellow & CMO Alejandra Alvira| CIND (Chivalry Is Not Dead) is a dating app that ensures quality over quantity through the traditional practice of gift-giving: you must give a gift in order to make a match. The recipient takes the full cash value of the gift and donates it to a charity of her choice. Citispoon - Co-Founder & CEO Dapo Kolawole|Citispoon is a hospitality technology company that gets restaurant guests closer to a decision pronto and helps restaurants interact with these guests and influence their dining decisions in real-time. Descifra - Co-Founder & CDO Rodrigo Sarmiento| Descifra delivers platforms that help customers predict a variety of outcomes such as revenue, number of clients or product/tenant mix. Descifra’s nature is to develop technology solutions that leverage the potential of “where”. Descifra has developed a SaaS (Software as a Service) platform that automates the location intelligence business problem using machine learning. Mycocycle - Founder & CEO Joanne Rodriguez| Mycocylce facilitates the remediation of toxic constituents out of materials through the utilization of an engineered ecosystem. Our goal is to contribute to a closed loop supply chain, converting waste into non-toxic materials for reuse. Narrative - Co-Founders Santiago Kuribreña, Joseph Schiltz, & John Trainor| Narrative offers a closed loop AI platform that uses cluster modeling to deliver hyper-segmented audiences, deep dive data for contextual customer insights, highly informed content development and continuously optimized distribution. Custom integrated dashboards bring all the complexity together giving clients clarity and ease of control over their customer and campaign journeys. Ordena, LLC - Presidents Javier Nava & Edgar Vazquez| Ordena is an automated ordering system that helps restaurants, grocery stores and wholesalers who want to autonomously order their inventory without having to physically create or deliver their order to their vendors. Our technology will know their traffic patterns and volumes to generate orders that will then be automatically sent to their vendors for fulfillment/delivery. Truckies - Co-Founder & Software Engineer Kristina Covarrubias| Truckies is a community designed to ease the stress of day to day trucking. For businesses, owner operators and employees. Uniting Soles - CEO Bernardo Salazar| Uniting Soles is more than just a shoe company. It's a movement. Leading with our conscience first, we aim to share a portion from the sale of each of our shoes with organizations fighting to reunite families and change immigration policy. ZestMama - Business Development Manager Alex Amparo & Lead Software Developer Gabriel Vega| ZestMama is an AI-powered food order management platform that enables order ahead to restaurants via text message or voice conversation and empowers restaurants to extend their client base through referrals, targeted marketing and loyalty programs. Imagine operating a business with connection speeds 100 times faster than today or downloading an HD movie in under five seconds. Those things will soon become a reality with 5G, the next generation wireless network, which will serve as both an economic engine and transformative gateway to future development. Each new generation of wireless networks has brought increased functionality to our devices. 1G delivered analog voice, 2G introduced digital voice and text messaging and 3G brought mobile data. Currently, 4G LTE is the wireless standard, which has ushered in the era of mobile internet. 5G is less of an evolution from 4G LTE and more of a wireless revolution in that it will serve as a platform for innovation, ultimately empowering new user experiences. We live in a world where connectivity is no longer a luxury, it’s a necessity. In the U.S. alone, there are more than 262 million smartphone users, in addition to more than 180 million other connected devices. And from 2016-2018, data traffic alone increased 238 percent. This demand for connectivity has created capacity constraints. That is why you might have trouble refreshing Twitter at a ballgame or lose GPS signal while driving. The transformative nature of 5G is illustrated by the 10,000 times increase in data traffic capacity it will support, while delivering more instantaneous and real-time access. Cell towers have traditionally enabled the capabilities of previous wireless networks. However, a new type of infrastructure, known as small cell nodes, is required for 5G technology. These small and inconspicuous nodes are typically installed close together on pre-existing infrastructure, such as streetlights and utility poles. Once connected, these small cells can help unleash the power and capabilities of the 5G network. Have you ever thought about how adding connectivity to streetlights could foster cost savings? Or how weather sensors and GPS could connect to deliver safer driving routes? According to a forecast from Gartner, Inc., there were approximately 8.4 billion connected Internet of Things (IoT) devices in 2017, a number that is expected surpass 20 billion by as early as next year. With 5G technology, there will be no shortage of connected IoT devices that could truly transform the way we live, work and play today. On a local level, 5G will play a leading role in fostering a competitive local business climate. It’s a technology that is key to Chicago realizing its future as both a smart city and global tech hub. National industry reports also show that 5G can generate approximately 3 million new jobs, $500 billion in new GDP and $275 billion in infrastructure investments. There is still a great deal to learn about the next generation wireless network and all that it will enable. But if there is one thing we know for certain, the 5G revolution is coming, and it is sure to be exciting. Crown Castle owns, operates and leases more than 40,000 cell towers and approximately 65,000 route miles of fiber supporting small cells and fiber solutions across every major U.S. market. This nationwide portfolio of communications infrastructure connects cities and communities to essential data, technology and wireless service - bringing information, ideas and innovations to the people and businesses that need them. For more information on Crown Castle, please visit www.crowncastle.com. At the end of last year the first cohort of IHCC’s The Founders’ Assembly came to a close. Over the past four months, six leaders came together to share how their teams, and more importantly, their ability to lead them, play a role in some of their biggest challenges. During this time, The Founders came together, “assembled,” if you will, to help each other explore these obstacles to growth more deeply and support one another to act on the tough decisions leaders are tasked to make every day. I was fortunate enough to be part of these conversations and to see the “other side of leadership.” As a member of a team, it is easy to be quick to judge our leaders and point out their missteps. But leadership is tough; our culture teaches us it is something we should all want, should all aspire to, and yet, it can feel heavy. It can feel lonely. That makes connecting with and learning from other leaders all the more valuable. 1) Don’t accept the status quo. Make the hard choice. For me, leadership means pushing what is possible, helping people live and work to their full potential and seeing the world as it can be, not as it is. Change can be uncomfortable, painful even, and fear of what that change means for us and others can paralyze us. During the course of our time together, several of The Founders made some tough decisions, but they all found that acting on them was the best thing they could have done for the organization and everyone involved. 2) Trust your gut (and the rest of your body). Listen to what it is telling you. It surprised me how often The Founders already had a strong sense of what they had to do but did not trust themselves enough to act on it. For them, the value of peer support was in affirming what they already knew. This fact does not diminish the importance of making thoughtful, informed decisions, but as a leader, if your gut is telling you something needs to change, you should probably listen. 3) When you let your commitments rather than your fears guide you, you are empowered to make decisions and lead with clarity. Knowing whether you have made the right decision is easier when you understand your organizational and personal goals, values, and commitments and can see how your decisions align with them. These decisions feel so much better than decisions we make out of fear or to avoid some outcome. We can be so much more effective if we understand where we want to go and what we need to do each day to get there. Otherwise, it is easy to get derailed in the day-to-day noise of life. To do this well, you need to constantly and intentionally make time to define your plan and make sure you stick with it (or adjust, as necessary). 5) Feedback is a gift. Don’t wait to give your team feedback; rather, share it when it is most relevant and useful. Few of us enjoy receiving or giving “constructive” criticism. It can feel deeply personal and attack the way we see ourselves (or the way we want to see ourselves). But getting feedback is how we learn and grow! Creating a culture where feedback is welcomed may feel uncomfortable at first but is one of our most powerful tools to strengthening our organizations and the people within them.